Tara’s kindergarten teacher told her mother that Tara would grow up to be the Prime Minister of New Zealand, or the devil itself. partner gained international attention by floating shares in their creative future, successfully funding themselves to Cannes. During her time at TBWA, Tara was named in Campaign Magazine's Top 50 emerging talent portfolio, submitted several entries into the iconic ABSOLUT portfolio, one of which was the creation of a limited edition ABSOLUT bottle design. 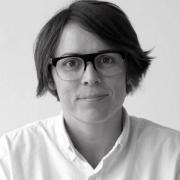 In 2012, Tara swam the ditch to join Saatchi & Saatchi Sydney. On the contrary to her kindergarten teacher’s premonition, it was at Saatchi’s that a common thread started to emerge in her work, Tara’s strong desire to do good and make a positive difference. From creating children’s books that test the eyesight of children, to an MS Society ‘numbing soap’ that brings home the effects of the condition (TED ‘Ideas Worth Spreading’), to creating real-time marketing platforms that reunite lost dogs with their owners, Tara continues to disrupt the status quo. Tara has won over ninety International advertising awards, been a named judge at D&AD, and AWARD, founded titsandads.com (a women’s collective website that celebrates women in advertising) and has supported other emerging creatives through the D&AD New Bloods programme.